This is Uganda small group tour ideal for a family or group of friends traveling together. However anyone can join in on the tour. The tour is scheduled for the December holiday of 2019. 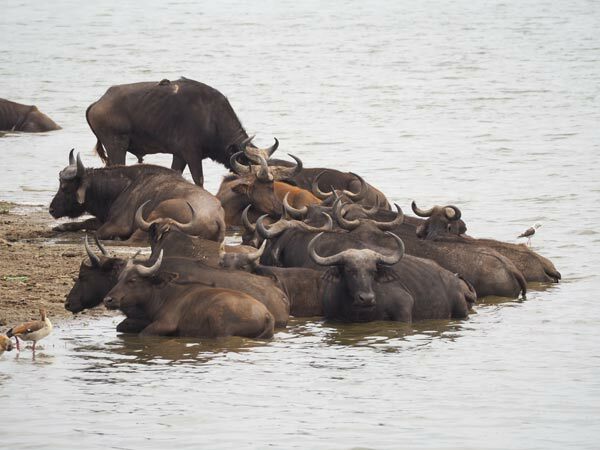 The group tour will take you to Murchison falls national park, for Big five experience (Lions, Elephant, Leopard, Buffalo, and Rhino), Boat cruise and magnificent views. The rhinos in Uganda are only found in Ziwa rhino sanctuary on the way to murchison falls. 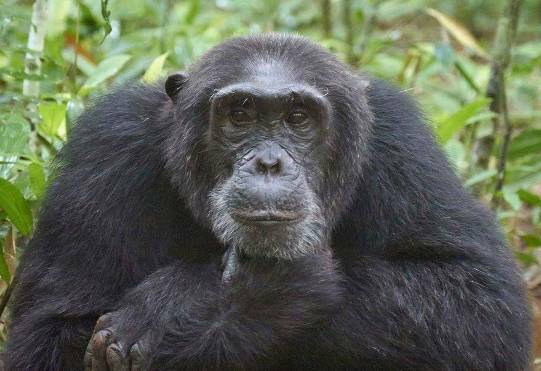 The safari also presents a chance to track Chimpanzee and 12 more primates( including; black and white Colobus, L’Hoest’s, Mangabey, Red-tailed monkeys, Baboons and so much more) in Kibale forest national park. 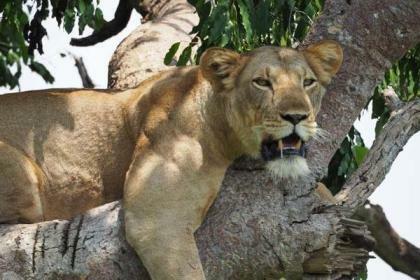 We also tour the "Ecological wonder of East Africa" Queen Elizabeth National park which is famous for Crate lakes, Hot springs, breath taking landscapes, tree climbing Lions in Ishasha, Elephant herds, Buffaloes, Leopards, several antelope species, Hippos, Crocodiles, Giraffes, and several other wildlife. We continue the tour with the famous Gorilla trekking in Bwindi impenetrable national park, relaxation and Canoeing on lake Bunyonyi and then ending the Safari with a tour of Lake Mburo National park for wildlife gaming (Zebra, Topis, Eland, Buffalos, Impalas, Warthogs, Leopard, Bushbuck, Crocodiles, Hippos, Fish eagles) and a boat cruise. Our Uganda group tour starts today. Early in the morning we depart for Murchison falls national park. We go through Kampala continuing north and then have a stop in the historical town of Luweero for fruits and some refreshments. We then continue to Ziwa Rhino sanctuary a private reserve, to track the first member of the Big five: Rhinos. The number of rhinos is greatly increasing having been poached to almost extinction about 2 decades ago. 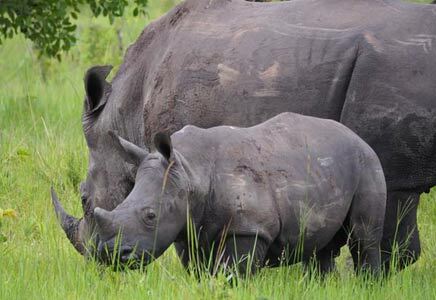 We track the rhinos and then continue to Murchison falls national park and get ready for an evening game drive with a lot of wildlife to see. After an early morning or with packed breakfast, we go for an early morning game drive. This is the best time to see wildlife since they are very much active during the morning hours. 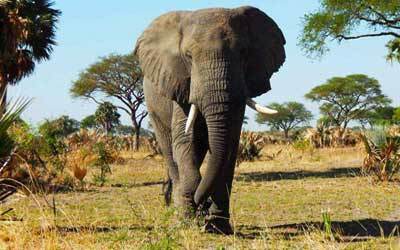 Some of the animals to be seen include: Elephants, Buffaloes, Lions, Leopard, Uganda Kob, Oribi, Rothchild Giraffes, Hyenas, Warthogs, Topi and several others. 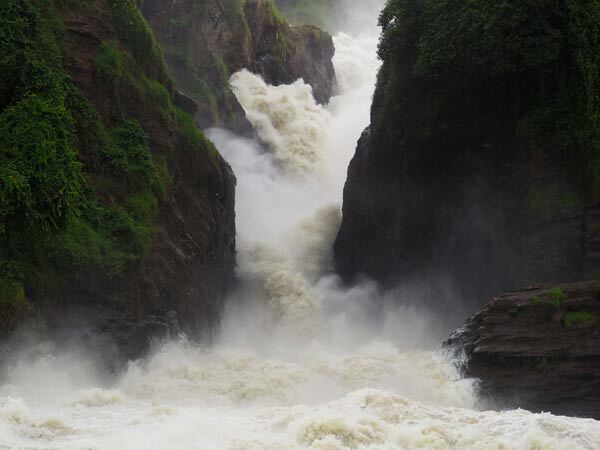 Upon finishing this amazing adventure, we return for a hot lunch and then go for a boat cruise on river Nile with beautiful views of the water falls. On the cruise we get to see Crocodiles, Hippos, plenty of Bird life including The African Fish eagle, King fishers and others. We conclude the day with a hike to the top of the falls for a relaxing water falls viewing. On this day, we checkout of the lodge and go for a game drive filling gaps missed in the previous game drive. 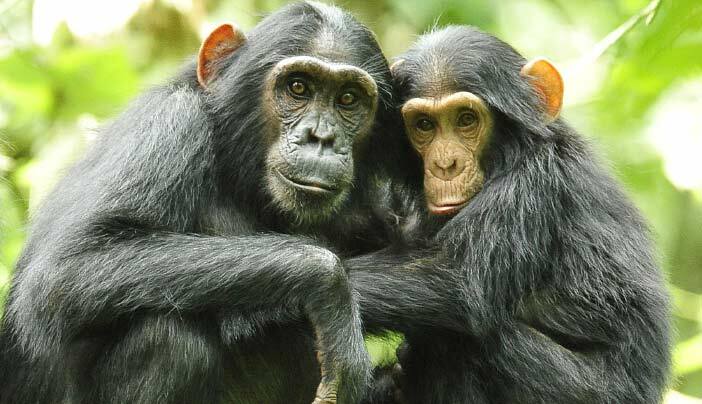 We then continue to Kibale National park, the Primate capital of Africa. On arrival, we check in and rest for Chimpanzee tracking the next day. Kibale national park is blessed with 13 primate species (Coppery-tailed money, Blue monkey, Vervet monkey, Black and White colobus monkey, Red tailed monkey, Red Colobus monkey, Olive Baboon, Thick-tailed bushbaby, Lesser Galago and others). On this day, we first go for Chimp tracking. Our driver will drive you to Kanyanchu visiting center for briefing and group allocation. You will then be led into the forest by a ranger guide to start on the trek. On the track, you will be able to see other primates and plenty of bird species such as; The crowned eagle, Green breasted pitta, Yellow-rumped tinkerbird. Upon locating the Chimps, you will have 1 hour with them before trekking back out of the forest. 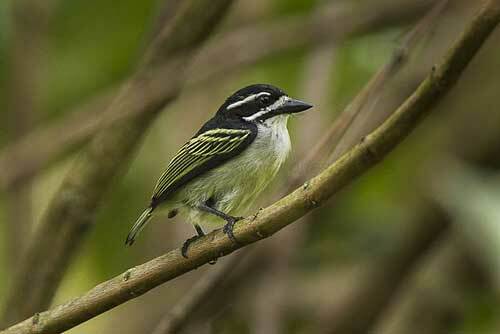 In the evening, we go for a Swamp walk in Bigodi for primate tracking and bird watching. Some of the birds include: the Great blue Turaco, Black and White casqued Hornbill, White browed Coucal, Ross’s Turaco, Grew backed Fiscal, African paradise Flycatcher, etc (over 250 species). On this day, we bid farewell to Kibale national park, heading for Queen Elizabeth. Queen Elizabeth is an Ecological wonder. The park is blessed with wildlife(Big four -Lions, Leopard, Elephant and Cape Buffalo), bird life, fresh water lake, crater lakes, salt mines and flowers. 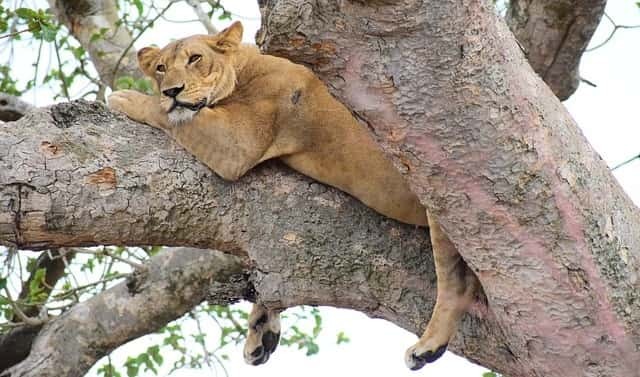 On arrival in queen, we prepare and go for an evening game drive in search of wildlife, Lions, Leopard, Uganda kob, Elephants, Buffaloes, and abundance of bird life. Our Uganda group tour continues today as we go for an early morning Game drive with our packed breakfast heading to Kasenyi open ground. This area is ideal for Game viewing with Lions on top of the list. On a lucky day, you might see these big cats in Action. In the evening, we go for a boat cruise on Kazinga Channel. This water channel joins lakes Edward and George and is a heaven for wildlife and birds such as Flamingos. 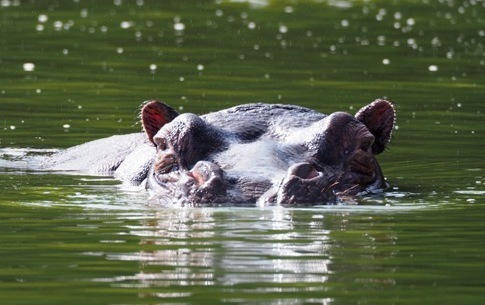 On the cruise you get to see Hippos, Buffaloes, Crocodiles, and other wildlife as they get their water break. We check out of the lodge and head to (ISHASHA) the southern section of Queen Elizabeth. This section is famous for Tree climbing lions. We then go for lunch and then head for Bwindi impenetrable National park for Gorilla trekking. This is the Mountain Gorilla trekking day. We wake up very early in the morning and head to the park offices for group allocation. You will then be led into the impenetrable forest by a ranger guide. The length of the trek depends on the location of the Gorillas. However upon tracking them, the ranger guide will then guide you to where they are and you will have only 1 hour with these gentle giants. After the experience, we trek back out the forest and then transfer to Lake Bunyonyi for relaxation. Today we will spend the rest of the day in Lake Bunyonyi. We enjoy the beautiful lake of islands. The lake is blessed with Bird life, clear water safe for swimming. We can go for a nature walk or Canoeing on this beautiful lake. We bid farewell to Lake Bunyonyi and head for Lake Mburo national park. On arrival, we check in, have lunch and then go for an sunset game drive in search of wildlife including; Zebras, Topis, Eland, Buffalos, Impalas, Warthogs, Leopard, Bushbuck, Twany eagles, Starlings and so much more. 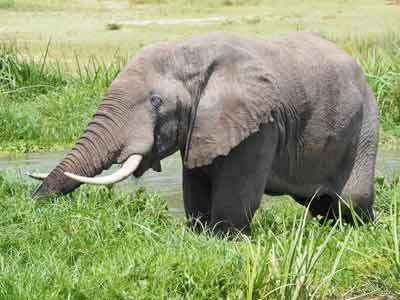 Lake Mburo national park is one of the parks that is safe to walk through. Today we will go for a walking safari in the park. 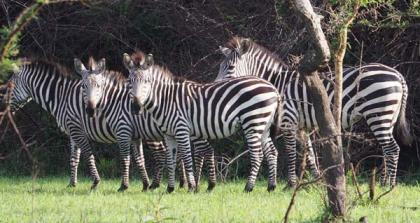 You will be led by a park ranger to see wildlife including Zebras, Topis, Giraffes etc. In the evening we head for a Boat cruise on lake Mburo for Bird watching, Game viewing and relaxation. Today we end our amazing adventure of Uganda. We bid farewell to Lake Mburo national park. We start on our journey back to kampala. We will then have a stop at the Equator for water displacement experience, Lunch or a cup of coffee. Here you can Buy a souvenir to help you remember your adventure in Uganda. Trouser and Shirts : Light trousers and long sleeved shirts are advised. Gloves: You might need Gardening gloves because you will be grabbing tree branches, leaves, name it, and some can be thorny. 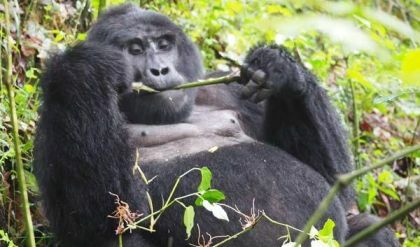 This 5 day Gorilla and Chimpanzee trekking tour brings you an encounter with Gorillas and our close cousins the Chimps in the forests of Bwindi and Kibale.